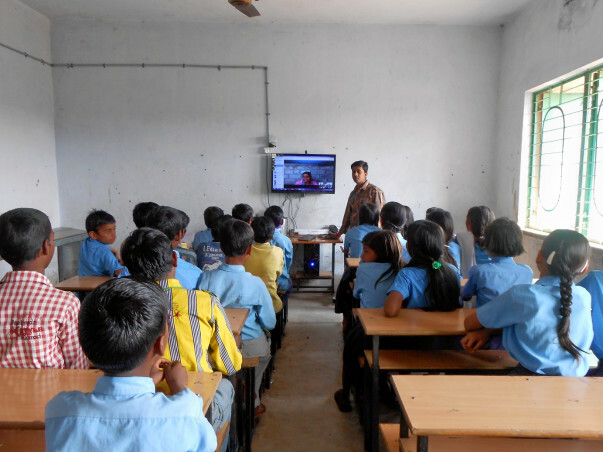 eVidyaloka is an aspiration to transform the education landscape in the rural and remote parts of India. eVidyaloka Trust, founded in 2010, is a non-profit organization registered in Bangalore, Karnataka in 2011 and governed by Section 12A of the Income Tax Act 1961, for the financial governance. eVidyaloka addresses the top 2 chronic challenges hampering the Quality in Education in the Government Schools, in Rural parts of our country - Teacher Shortage and Teaching Quality. The model brings people with passion together across the Globe, leveraging the power of Technology and enables access to high quality teachers to the children in the remotest villages of India covering from Rural to Tribal regions of this country. It's focussed on the children in the age group of 10-14 (6th to 8th grade), delivering live interactive classes in the local medium, through a powerful partner eco system. eVidyaloka's objective is to have every child able to Understand and Apply the concepts of his/her particular grade and subject, thereby ensuring accessibility and affordability of high quality teachers and teaching resources. Andhra Pradesh & Tamil Nadu), involving 180+ teachers spanned across 76 cities, 13 countries across the globe, delivering quality education in regional languages to over 1200+ children. An open content platform (wikiVidya) is being promoted, where volunteers build standardized lesson plans, aggregate the digital resources and aids for a consistent learning experience to the children in vernacular languages. In the upcoming Academic Year 2015-16, eVidyaloka will establish a scalable, replicable and sustainable service delivery platform, with a desired learning outcome for 2500+ children across 50 villages across 5 states (Karnataka, Telangana), through 400+ active volunteer teachers. For Child sponsorships: Will I know the specific Child(ren) details ? eVidyaloka targets an optimal strength of 45 students per Centre. As we work with Govt. School children, We may not be able to share specific child details, as this is the generic class room operating cost, for this classroom strength. However, if your sponsorship is for a Full class (15 children), we will communicate to you, the associated Centre details. What is Rs. 3500 is used for ? Children in the villages, gets additional learning opporutnities, taught by high quality teachers from all over the world through eVidyaloka. This is the operating cost at eVidyaloka, to enable this quality education throughout the year. Where can I know more about eVidyaloka model details ? Please do visit our General FAQ to know more.